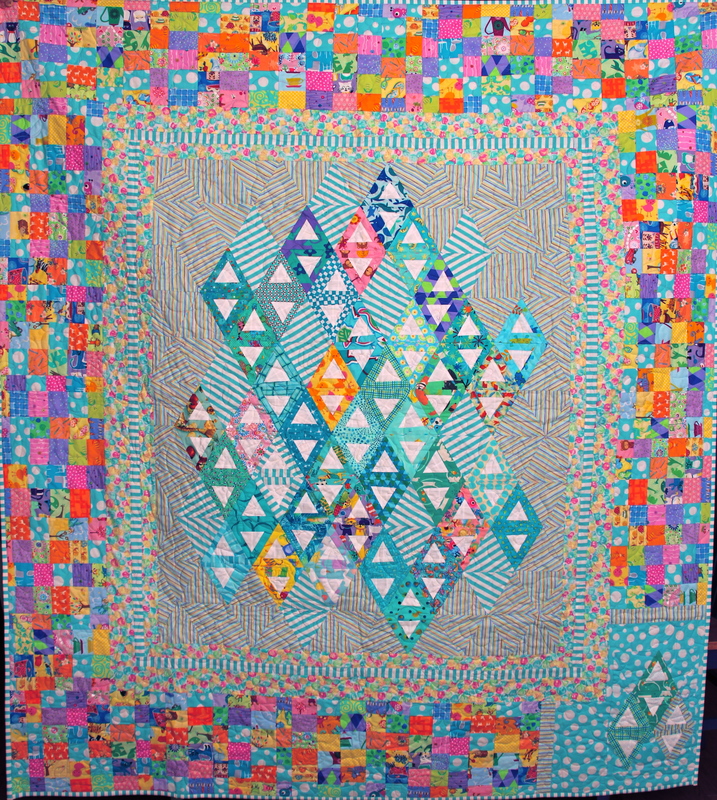 I seem to like triangles – a lot! There are so many different ways to use them and they’re easy to play with. I was experimenting with a lighter color palette in this quilt. 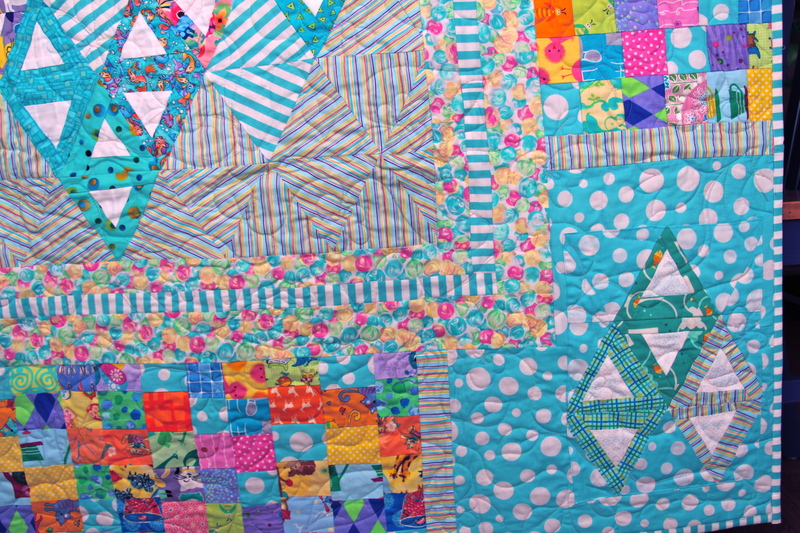 My key color was aqua because it looks so fresh and I have never made a quilt with aqua as the focus color. I like how the hollow triangles look but I also like how the striped triangles turned out as well. I had a ball mixing everything up and putting them on my design wall! These triangles are great fun. 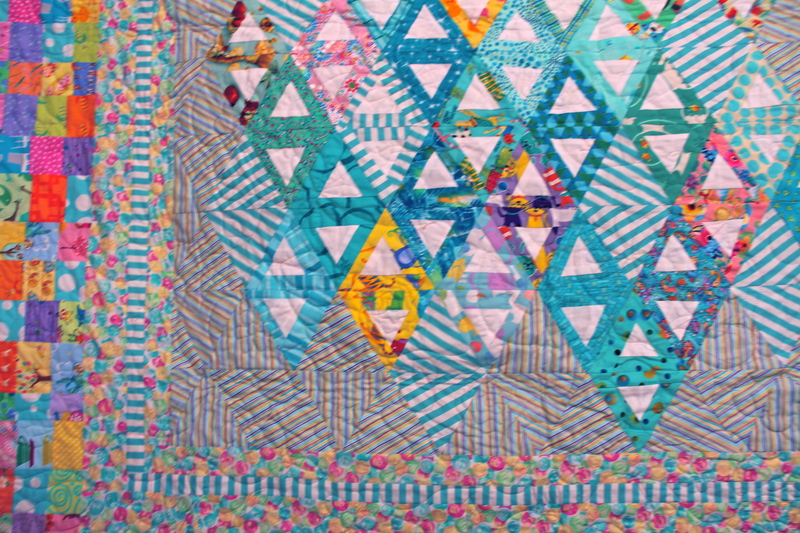 I like seeing the aqua in your quilt. A great contrast with the border. And I really like your solution to filling the last space in the border. If you hadn’t told us, I would have thought it was the plan all along. I am in love with triangles right now. I think the “crazy corner” looks like an asymmetrical design element. I would not have guess that you ran out of blocks. LOVE triangles. Warning, they are addicting!! LOL I am working on my second triangle quilt in a month. . . I agree – who knew they were SO versatile? 🙂 Love yours and I agree – never would have thought a thing about the corner on the border, I think it looks fabulous! Love your triangles! This top is so much fun! Hi Ramona 🙂 Thank you! 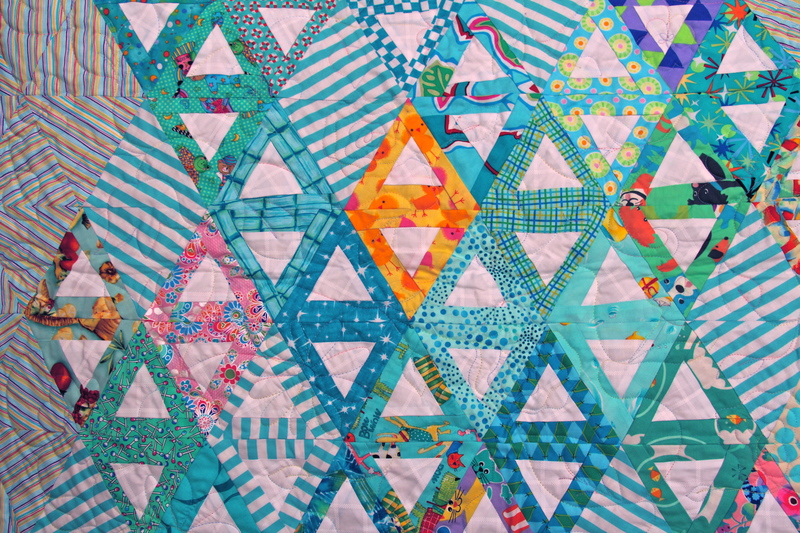 I love making triangle quilts and got a kick out of trying a new color scheme. What a great way to finish off the border when you run out of your planned border. Such a creative quilt! This is such a fun quilt. Sometimes finding creative fixes to problems results in the best quilts. It definitely did here. Hi Kymberly 🙂 thank you. I wasn’t too sure how my fix was going to look at the end. Have a great weekend. Your quilt is fabulous!!! Love the colors. I think the bottom corner looks perfect. If you hadn’t said you ran out of your ‘crazy mish-mash’, I would have thought it was a very clever and deliberate design feature. I love the colour choices in this. They are so wonderfully cheerful.